United Methodists from across Indiana and the greater connection welcomed Indiana’s new resident bishop, Julius C. Trimble with a vibrant, multicultural service representing the diversity of and ministry throughout the Hoosier state. Excitement was in the air as more than 1,000 in attendance, in person and online, worshiped, praised, remembered, and thanked God for the assignment of Bishop Julius C. Trimble and First Lady Racelder Grandberry-Trimble to serve the Indiana Conference for the next quadrennium. Passionate, uplifting, and spirit-led worship helped move participants into a time of celebration and praise as musicians and choirs from St. Luke’s United Methodist Church, Indianapolis University United Methodist Church, and Muncie College Avenue sang some of Bishop Trimble’s favorite songs including Order My Steps and Total Praise. The praise band from Iglesia Cristiana Getsemani also led worship in Spanish and English, highlighting the diversity of ministry in Indiana. A formal introduction of the bishop was received with warm applause and a standing ovation by attendees. 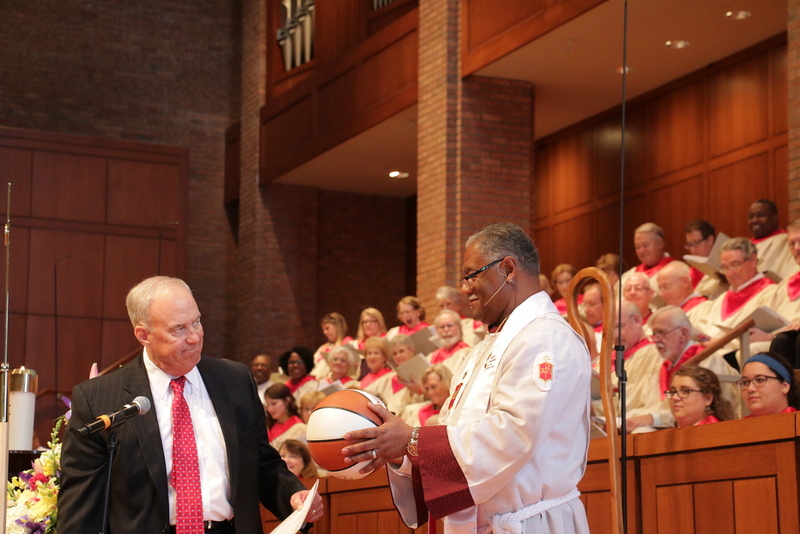 The service also incorporated a presentation of signs and gifts of the ministry of the episcopacy to Bishop Trimble, including a basketball signed by Indiana University Coach Tom Crean, signifying a Hoosier’s love and dedication to the game, which was met with laughter throughout the crowd. First Lady Racelder Granberry-Trimble gave thanks for the Hoosier hospitality shown to herself, Bishop Trimble, as well as the boxes that filled their home. “Being a bishop comes with certain expectations,” First Lady Racelder mentioned that she is a partner in this ministry with her husband which is why she is referred to as First Lady Racelder Grandberry-Trimble. The title reminds her of the commitment which God has called both her and Bishop Trimble to in their service to the Church. First Lady Trimble commented on the process that has led them to this day saying, “God we are still, and we are still listening,” referencing Psalm 46:10, a scripture that has been a constant reminder to them throughout their journey of shared ministry over the years. Bishop Trimble took the time to acknowledge and thank the countless friends and family who were in attendance, as well as a moment of reflection on the anniversary of 9/11 before continuing his sermon titled “More than Enough,” focusing on a passage in the Gospel of Matthew where Jesus feeds the 5,000. Bishop Trimble then weaved stories and illustrations throughout his sermon recounting of times when there always seemed to be more than enough when it came to resources. One story included details of his mother’s divinely delicious homemade biscuits on Sunday morning. Bishop Trimble explained that they were highly coveted and continuously shared with all who came to their table. “You see, In God’s economy, there is always more than enough to invite someone else to the table. Our job is simply to pay attention, be astonished and tell people about Jesus,” shared Bishop Trimble. The service concluded with a time of communion, worship and a blessing given by Bishop Julius C. Trimble which was followed by a reception where members of the conference were able to greet Bishop and First Lady Trimble. Update: During the Welcoming and Celebration of Assignment service, a special offering was taken in support of the Indiana Disaster Fund and UMCOR to aid in the ongoing relief efforts for Kokomo and South Bend, Indiana. The amount collected was $5,201.26. Residents in Kokomo and South Bend have experienced severe damages to their communities due to recent storms and tornadoes that have impacted Kokomo, and severe flooding in South Bend. To see images from the Welcome and Celebration of Assignment Service for Bishop Julius C. Trimble, please click here. Welcoming and Celebration of Assignment Service for Bishop and First Lady Trimble from Indiana Conference UMC on Vimeo.